When the So – Back To Front tour was announced for North America I knew I wanted to see some shows on the West coast. During the last ten years I had only travelled to the East coast for Gabriel and Genesis, but I had not been to California and Las Vegas for more than twenty years. This was the perfect opportunity. What was even better, a couple of my friends from the States would be there and we were sure we would have a blast – in Las Vegas, Los Angeles, San Diego and Santa Barbara. Ticket prices in the U.S.A. were much higher than in Germany, particularly for the VIP soundcheck access that amounted to $580 in the first category (Gold Hot Sound Package). Except for Los Angeles where it was a hundred bucks extra... I decided to spend that kind of money only once, in Las Vegas where I got a seat in the second row (according to the ticket). The Hot Seat Package secured me a seat in a Terrace Box, which is a square box with four fold-out chairs and foldaway tables (for picnics) for a mere $325. 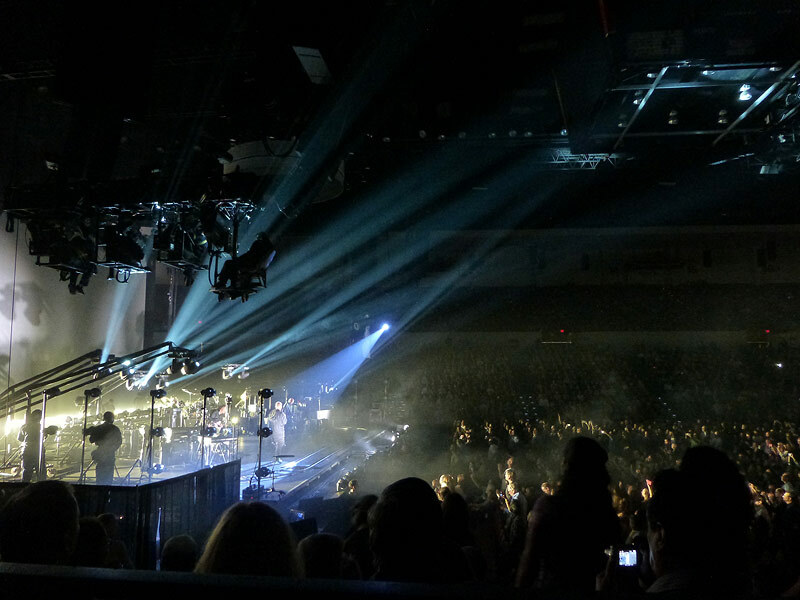 In San Diego I wanted to have an elevated seat to the side of the stage so that I could see it all from above yet still from close. In order to enjoy the great open air location at the Santa Barbara County Bowl with a bigger view (and to save some money) I picked a seat towards the rear. My first show was in Las Vegas with VIP admittance, so I had to be there for 3pm. As with previous Gabriel tours there was a table near the entrance where we could pick up the „exclusive merchandise items“ and the wristband that secured admittance. We also got the laminated pass with a lanyard and quite a large blanket, both with the So artwork. We were let into the venue proper around 4pm – Peter excepted, the band were already jamming on stage; at one point David Rhodes seemed to play some riffs from his recent solo album, but apart from that there was no discernible song. A couple of minutes later Peter arrived, got his applause and greeted us saying: „Hi there, welcome to the wonderful world of soundcheck! This is where we attempt to sort out everything that we screwed up last time.“ First they rehearsed a part of Secret World; Gabriel told Rhodes he had moved into the solo to early, and so they played the song from the third verse to the end. Gabriel seemed content and briefly introduced the band to us before they played No Self Control in its entirety. Big Time was next and he even introduced Dan Levy who had married the previous day in classic Vegas style complete with an Elvis Presley imitator. It got even better – they then played Games Without Frontiers, which, Peter said, they had not tried to play before. It sounded quite finished, though Gabriel did not sing with full force in the verses. As with the other songs they rehearsed there were no lightshows or screen projections. After Games he explained the three parts of the show to us in much the same way he does in the beginning of the concert. A big chunk of Shock The Monkey came next and was followed by O But or whatever the first song of the show is called... At the end he wryly commented „And if you have any idea what the hell I'm singing please let me know“ before he left us with the words „Thank you for coming to soundcheck and we'll see you later on!“. He left the stage, the other musicians fiddled around a while longer though there was not much else to hear and we had to leave the venue a few minutes later anyway to go upstairs and enjoy the buffet. Nothing out of the ordinary, but it was pretty decent with warm dishes, salad, white bread muffins and a voucher for a drink (including beer or wine) from the bar in the venue; all other drinks we had to pay for ourselves. While we were eating we could hear Jennie and Linnea's soundcheck through the open doors; it would always follow Peter's soundcheck. We could also amble over to the merchandise stall and shop to our hearts' desires. And then my first Back To Front show began! The Planet Hollywood Ballroom in Las Vegas was probably the smallest venue on the tour. There was not even a barrier right in front of the stage. My seat in row 2 turned out to be a de facto seat in the first row, as the front rows were slightly curved so that the first row ended just before me towards the middle aisle. I sat slightly to the left, opposite Tony, as it were, only some six feet from the quite low stage away. Now for the course of the shows; there were pretty much all the same though I am going to discuss differences and special moments below. Jennie Abrahamson and Linnea Olson start off the show with Jennie on piano and Linnea centre-stage with the cello. 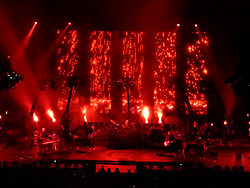 Both play four of their own songs, for which they are introduced by Gabriel himself, just as he would introduce Ane Brun at the New Blood shows. She was meant to be be there, but fell ill just before the tour. 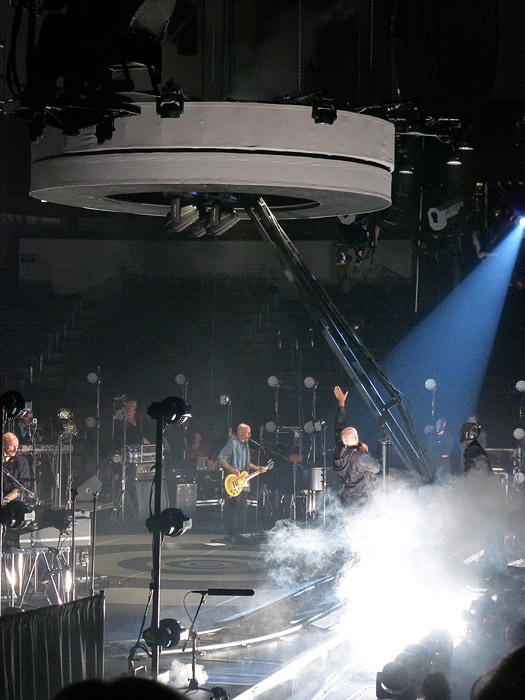 After the four songs there is a fifteen minute interval the crew uses to re-arrange things on stage and to do a line-check. In the meantime we get to hear some of the covers other musicians did of Gabriel songs for the Scratch My Back project and, after that, Floating Dogs, which had been the final song before the show in 1986/7, too. 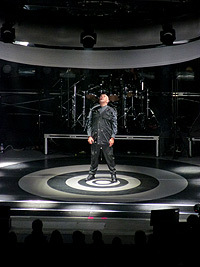 He enters the stage alone while the house lights remain bright and stands at the microphone in the middle of the stage to explain the concept of the show. 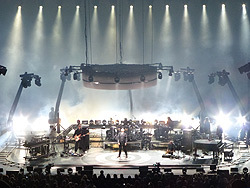 There will be three parts; the first one is to appear like a soundcheck or a rehearsal where you can see how the songs developed – acoustic and with the house lights on. 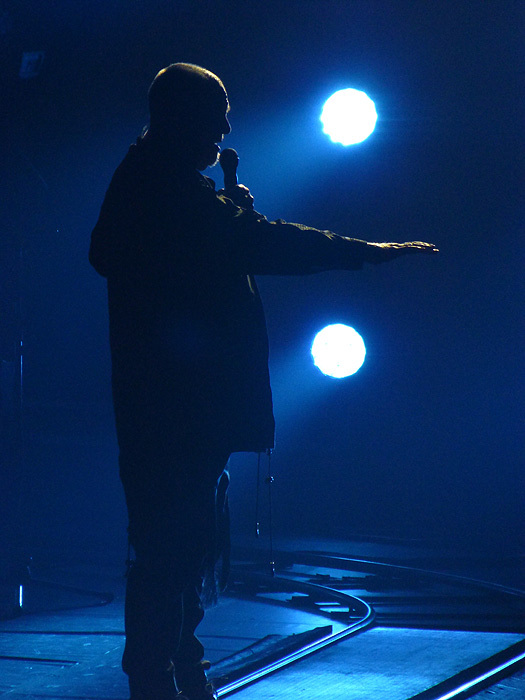 The second part he calls the electric one, and once we had made it through that we could look forward to our dessert, the full So album from beginning to the end. After these introductory words he asks Tony Levin to join him on stage and sits down a the grand piano (which stands in much the same place as for the New Blood shows) to play the unfinished song whose harmonies remind me of That'll Do. The other musicians come on stage for Come Talk To Me and are introduced briefly. This song and Shock The Monkey sound very different in their acoustic versions. They have been reduced to the essential elements. The house lights remain on all the time until the middle of Family Snapshot with only a couple of neutral spotlights on a rather dimly lit stage. At the moment when Family Snapshot moves into the louder part („they're coming round the corner with the bikers at the front“) the house lights go out, the side screens and the big screens in the rear go on and we suddenly find ourselves in the middle of a full light show. An impressive effect at this very point in the song – and the second half of the song actually sort of belongs to the electric part of the show that really gets going with Digging In The Dirt. David Rhodes' guitar sound tears and carries this song better than ever, conveying all the anger in it. Not surprisingly, Gabriel's face-cam returns. This time it is held by someone from the road crew, who are dressed all in black with black fencing masks that have a silver skull painted on them. Secret World is good fun again, for the band, too, and they all bend back again as far as they can. The Family And The Fishing Net is introduced as it was back then; it remains the weirdest song in the set. The movable light dollies are put to good use for this and underline the mood of the song. When No Self Control began I wondered whether Gabriel would roll on the floor again to avoid the lights. 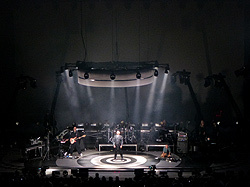 The scene is repeated but Gabriel remains standing while the lights swing and hover right above his head. 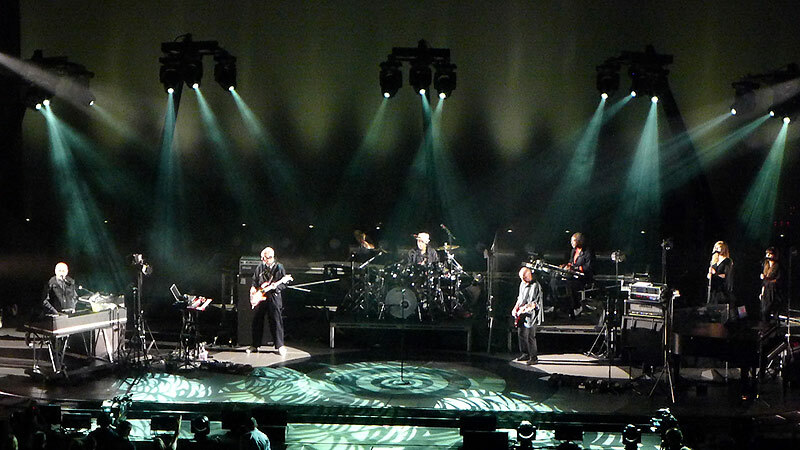 The audience really participates in Solsbury Hill, and on stage Gabriel, Levin, Rhodes march to and fro behind the drumkit. After that they take it down a notch and play Washing Of The Water, at least, at most shows. In San Jose, Las Vegas, San Diego and Uncasville they played Humdrum instead, and, introducing it, he mentioned that he got many requests for that song. 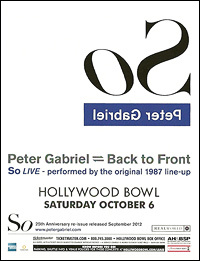 Then it is „end of part 2“, and Gabriel announces the So album „from start to finish, hopefully uninterrupted“. 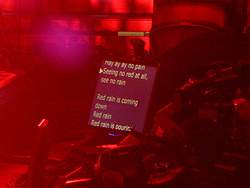 Red rain on the screens and red light from the spots accompany Red Rain. 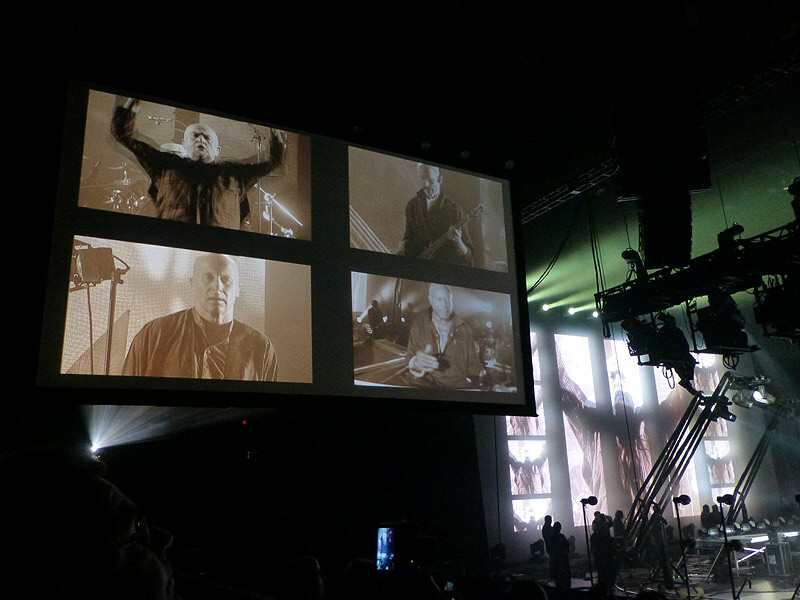 The intro for Sledgehammer is rather brief, there are many different light colours during the song, as a sequence, not simultaneously, and Gabriel strikes the poses that simply belong with this song. The stage darkens to a deep blue for Don't Give Up, changing to a kind of violet when Jennie sings her parts. She really sounds a bit like Kate Bush, though perhaps not with as much personality. 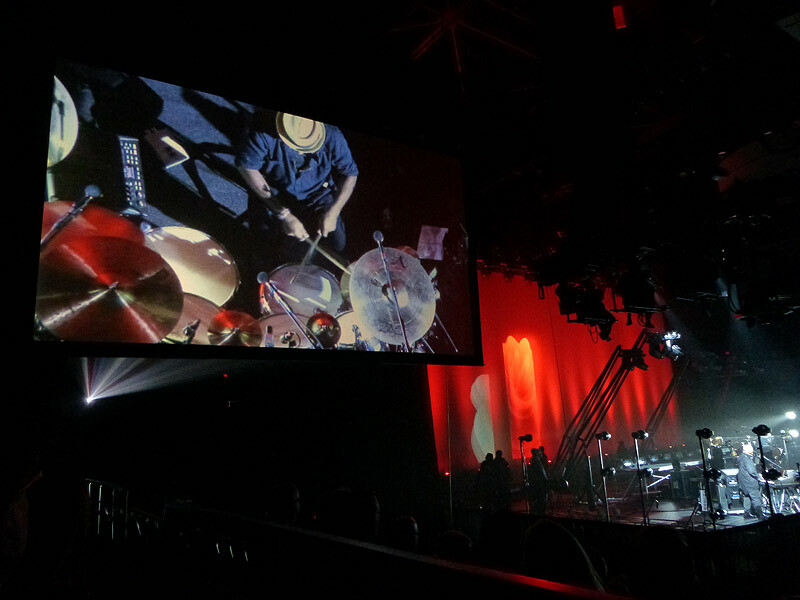 At one point in the song Gabriel passes behind the drum kit with a little black suitcase before setting it down again. 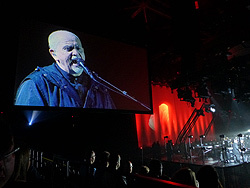 That Voice Again is marked by red lights in the background and different colours up front. Tony Levin does magic on his Chapman stick. Gabriel stands behind the keyboards for the whole song. 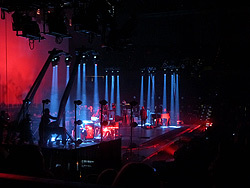 Mercy Street comes with dark blue lights, as could be expected, and Gabriel lies down in the middle of the stage after the acappella intro, while the lights circle around him, illuminating parts of his face. Then a Black Man from the road crew appears with a light at the end of a staff and shines it into Peter's face. Before he gets up again at the end of the show he rolls around on the floor and puts on his hood, taking it off again right away so you hardly notice he's doing it. The show continues with „B-B-B-B-B-Big Time!“ Everything is loud, the sound and the lights. The screens show more or less distorted close-ups of the musicians, and Gabriel struts and poses across the stage as for Sledgehammer. Gabriel sits down at the piano for We Do What We're Told. Everything is flooded with red light. 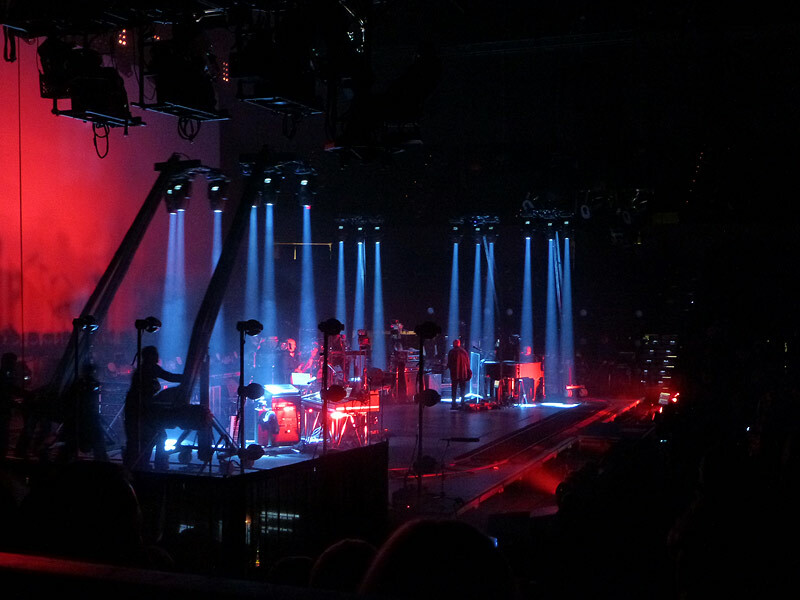 Then the light dollies move to the front with vertical light beams. The Black Men with their skull masks stand behind them with their arms folded. A ghostly scene. Total obedience. The gentlemen line up in the middle of the stage for This Is The Picture. On both their sides are the women looking sideways at them. Gabriel and Sancious have keyboards hanging round their necks and Manu Katché has a kind of mobile drum pad. There are, however, no band introductions. At the end they all run around in a circle turning around themselves – and freezing in their movements at the last beat. Tony's deeply voiced „In Your Eyes“ is also there, of course. From the visual side there are all the colours in the rainbow. Jennie takes over Youssou's part, and then Gabriel, Jennie and Linnea run to and fro across the stage, as per the tradition. Now follows the band introduction. In Las Vegas someone else was introduced, too, namely Dan Levy, who got married the day before. His wife was also called from the audience and joined them briefly on stage. 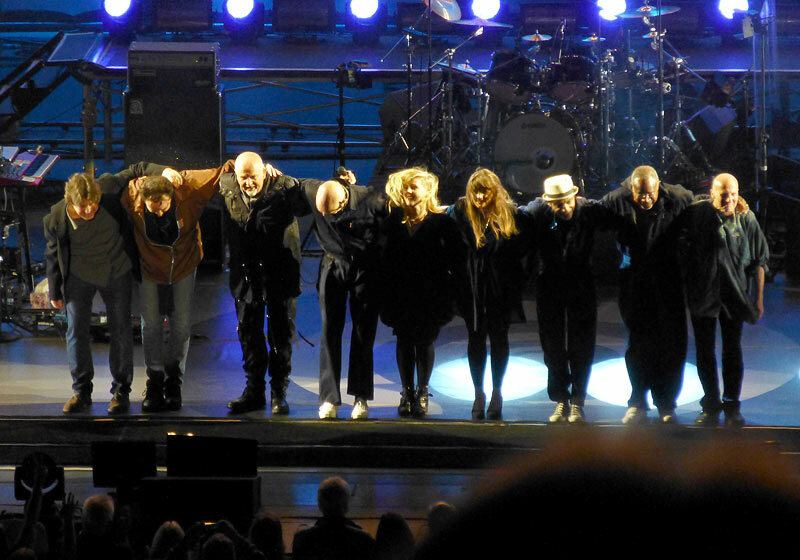 Everybody's bowing ends in the traditional way by the band bowing and sticking their bums out to the audience. 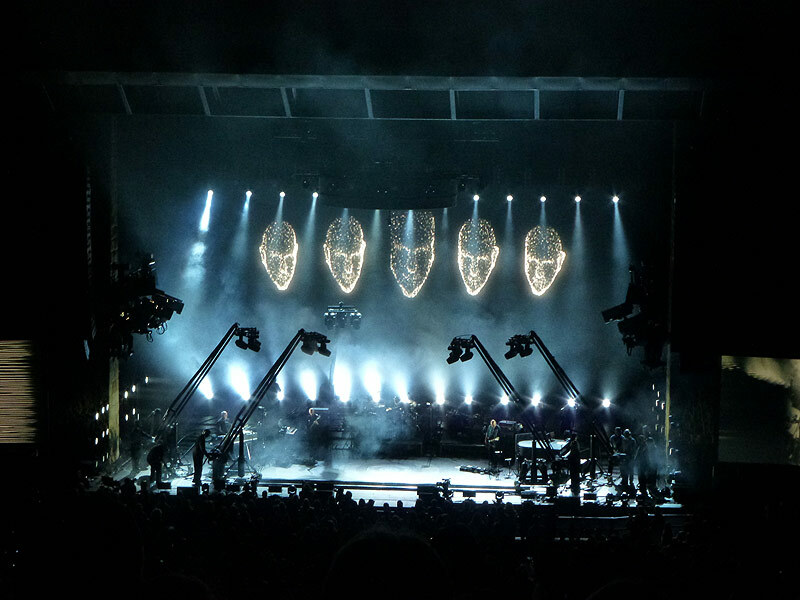 The encores do not feel like encores but as full parts of the regular set. 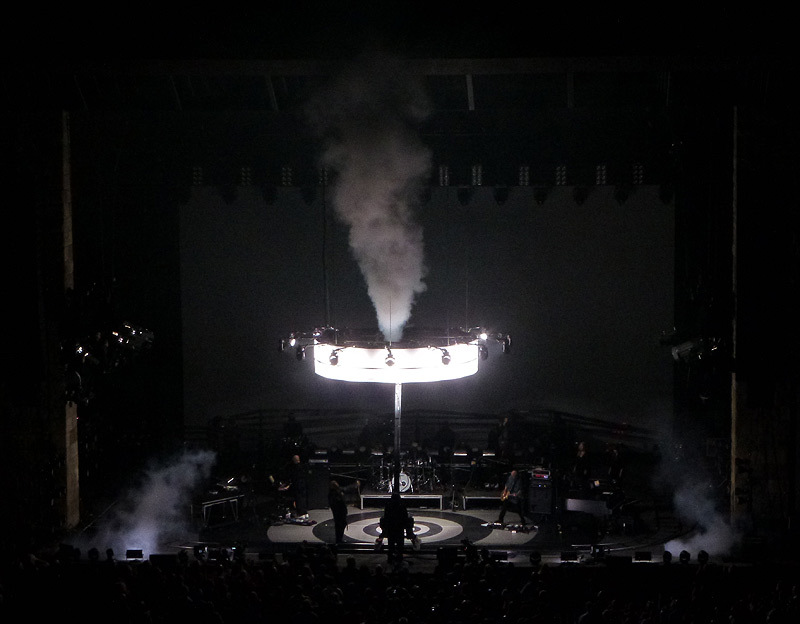 Mainly so for The Tower That Ate People where the round construction that is hanging above the stage is put to full use for the only time, answering everybody's wondering what that thing is for. 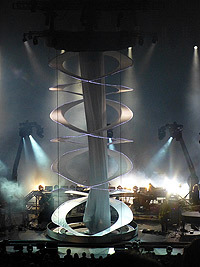 It moves down until it encircles Peter completely, then it sort of spreads and hides him in a cylinder of white cloth that reaches to the top with a spiraling structure around it. Peter seems to be moving around in the cloth, presumably as if the tower tried to eat him – and with the last beat of the song the cloth drops. 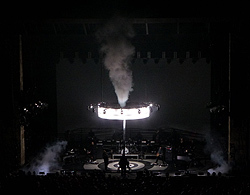 This brings back memories of The Lamia, though the round construction at the ceiling of the stage also reminds one of the Growing Up tour where a similar but larger contraption was used a lot more. 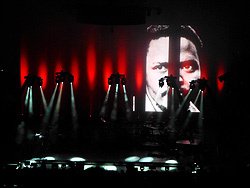 Biko is introduced with a brief speech in which Peter links current events of uprisings in the Arabic world, the power of the internet and mobile phones with the history of Steven Biko. The song runs its usual course (with the raised fist) and the musicians leave the stage one by one at the end, Manu Katché last. 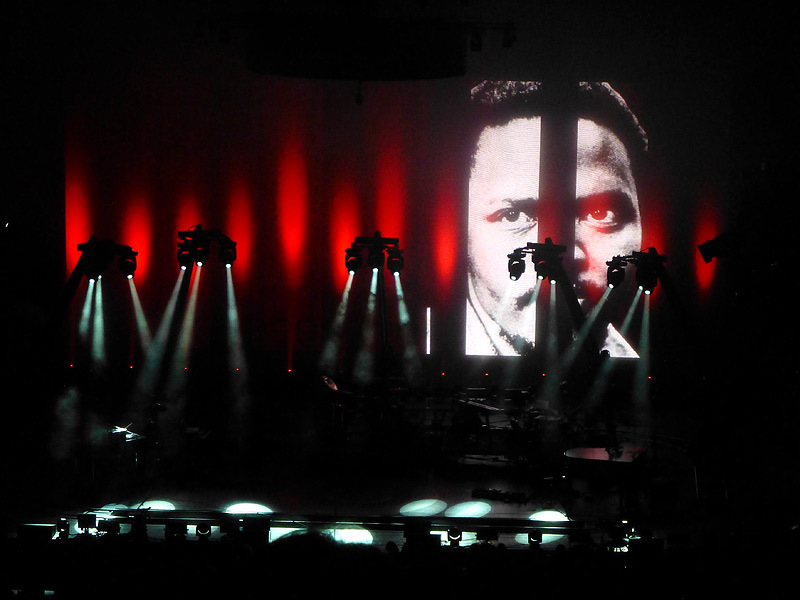 What remains is the portrait of Steven Biko on the screens. 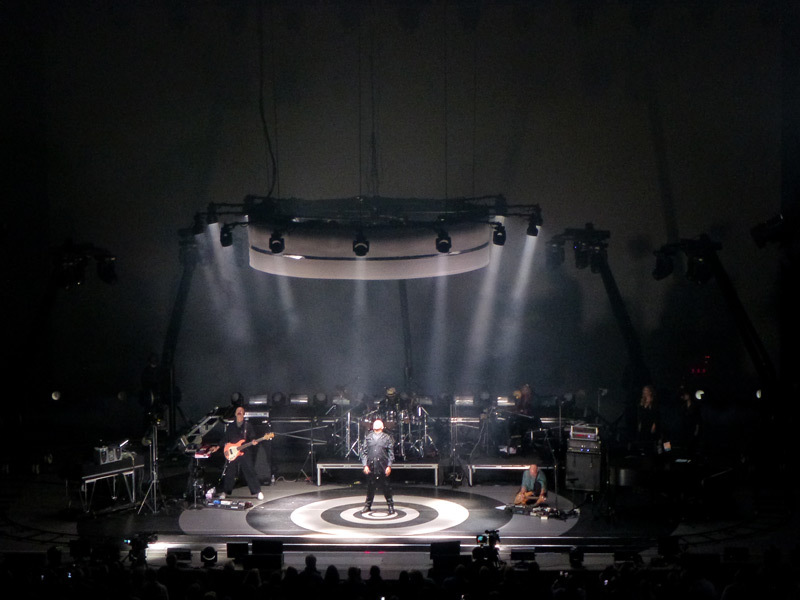 What impressed me most, musically speaking, was Gabriel's voice that seemed to be even better than on the Growing Up tour. 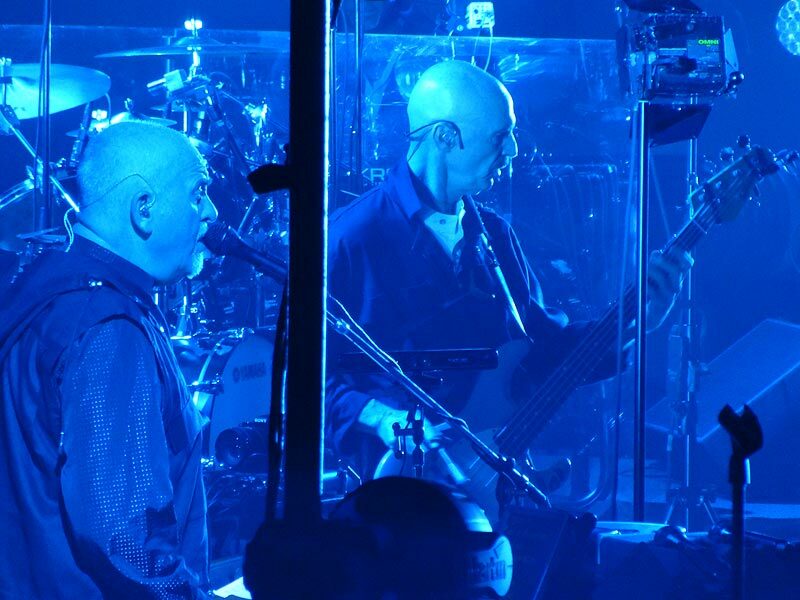 Tony Levin is always on the same high level, and there are no signs of David Rhodes slacking off. It's hard to say anything about David Sancious other than that his In Your Eyes solo is unspectacular. 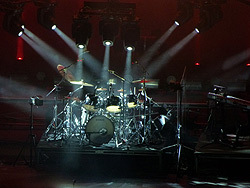 Manu Katché is often described as Gabriel's best drummer for his intricate style. 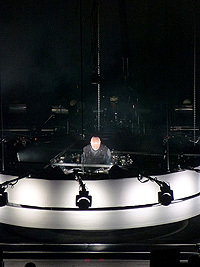 On this tour I had the impression that he did not quite play all out so one could not make out his own style. He is certainly different from Ged Lynch, but he does not seem to leave his own mark. John Cusack came onstage with an oldfashioned boom box held high in his hands in an allusion to the film Say Anything, in which his character held up a similar machine that played this very song to get the attention of the girl he loved. The title of the film went unmentioned, but the audience seemed to get the reference anyway. David Rhodes was so kind as to give me a Pre-Show Access Pass for Santa Barbara. So I got to get backstage before the show where there was a small table with refreshments. It turned out that the pass was mainly for friends and relatives of the musicians and the crew. 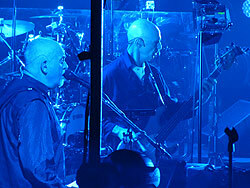 Tony Levin's daughter was there, for example, who you can see on some of his photos on www.papabear.com. We were not allowed to enter the actual catering area and the backstage proper and had to leave at the end of the opener, but while I was there David Rhodes and Tony Levin came out and so I got these photos taken. 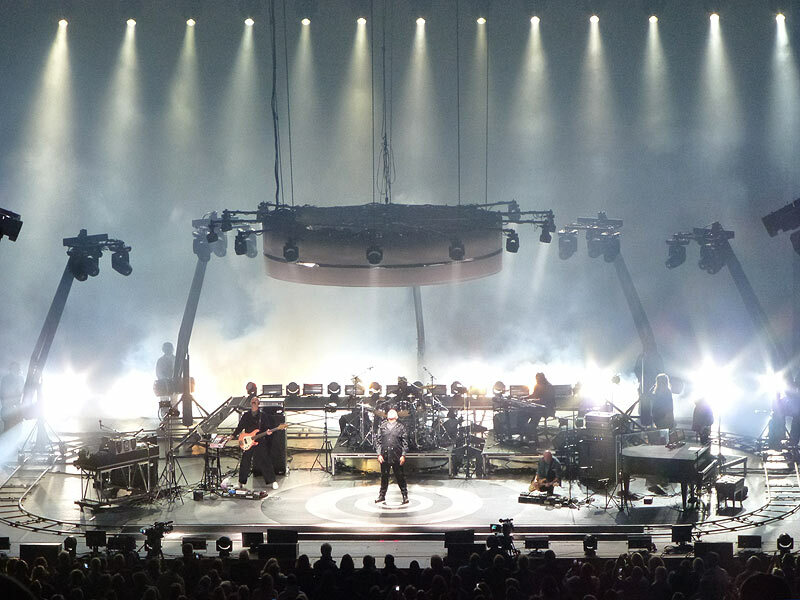 The journey to see these four shows has really been worth it – and it proves that it makes the world of a difference to experience the show yourself and not having to rely on sound and video footage from themusic.com and/or Youtube. 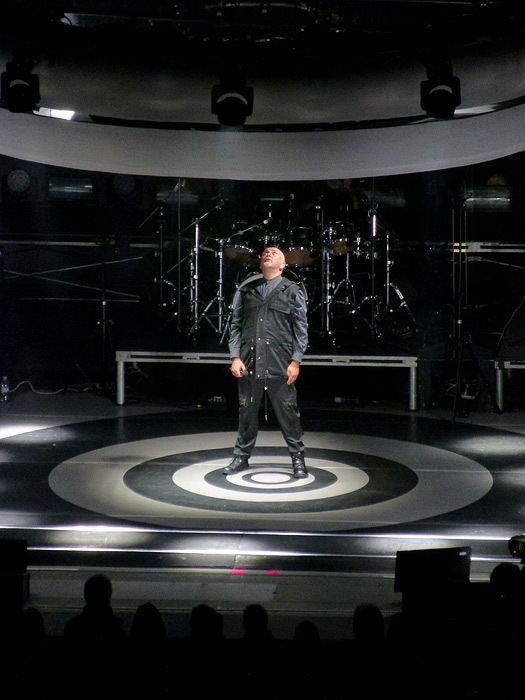 When the tour continues in Germany in October 2013 I will be there again!